This will be second article in the series of articles about Mac OS X Server 10.5 setup under VMWare. In the first part we’ve discussed setup of virtual machine and using image file instead of DVD to install OS X Server 10.5 on VMWare virtual machine (VM). To remind, when creating image file from retail install DVD, do not use built in Disk Utility for image creation, use Toast instead. Choose Copy from the right hand menu, and under File menu, choose save as Image. Change extension to .iso, choose location and click Save. Once image creation is completed, start VMWare, under new machine choose Mac OS X Server 10.5 (experimental) (I’m trying 64-bit right now), assign standard 40GB disk space (use more if necesary) and follow on-screen instructions. Once finished, VM would reboot and, upon logging in you will have your freshly installed Mac OS X 10.5 Virtual Server. Server Admin would automatically launch and… you will get error saying that server could not be found. Do not freak out, your server does not know fully qualified name just yet, you need to add it to your local DNS server and assign static IP to your new VM Server. Run all updates and we will be ready for services setup. It seems that updating Server to 10.5.7 breaks VMWare. After reboot, VM hangs on grey screen with Apple Logo. I am currently working on resolution by updating to 10.5.6 and seeing how it goes from there. After talking to Brian from agis, I’ve decided that the way to utilize our existing XServe that has nothing running on it but FileMaker 9 Server is to implement virtualization method. The plan is beef it up with RAM and have core server installation hosting multiple VMWare machines. For us it was the matter of spending $7,000 on new XServe with all backup drives for existing and new one or spend $1,700 on licensing and backup drives just for one. Choice is obvious. So here I was, playing with freshly installed VMWare and freshly created DMG file in DiskUtility only to find out that VMWare does not like DMG. Fine, convert it to iso/cdr using hdiutil command. Nah, everytime I try to start VM I get BIOS read error. I’ve searched for it everywhere. So far instructions have been quite straight forward. Use install disc or iso image, if you have dmg – convert it using hdiutil…. But it does not work… in rare cases, when I do not get error, Please wait while DVD is loading message sits forever, and I mean forever without any changes. My home computer, after displaying that message for almost 8hrs, still has |/-|/- spinning. Well, nowhere I found that dmg file and therefore converted iso from it, nor cdr created in Disk Utility work with VMWare. Anybody out there got it working, share with me. I had to use Toast. Open Toast, load OS X Server Leopard Install Retail disc, select Copy from the left columns (Data, Audio, Video, Copy) and choose File->Save as Disc Image… navigate to the folder where you want to save it, change .toast extension to .iso and click Save. Now, this ISO file is working file with which you can easily install Virtual Mac OS X Leopard Server, as I am doing right now. Have it ever happened to you when using Command Workstation to change job properties, standard Properties window does not come up and quick error message flashes with: “Failed to load shared library /usr/lib/jpwx.bundle (error 2: No such file or directory)” ? We’ve had this happenned on couple of machines in our office. It took about 2-3 weeks of phone calls with Xerox developers ti finally resolve the issue. So here is how to fix it. Xerox recommends uninstall Fiery utilities and reinstall them using either downloaded version from their site, or, in my case, they’ve provided version 1.6.0f.10 of CWS which I downloaded from their FTP site. Regardless, uninstalling, as many of us Mac users know, involve dragging Fiery folder from Applications to the Trash and that’s it, right? Wrong! Here are two ways completely uninstalling CWS. One os very simple, specifically for end users curtesy of Xerox technician. Second is Terminal commands which can be executed using Apple Remote Desktop on large number of workstations. Click the Finder icon located on the Macintosh Dock. A Finder window will open. 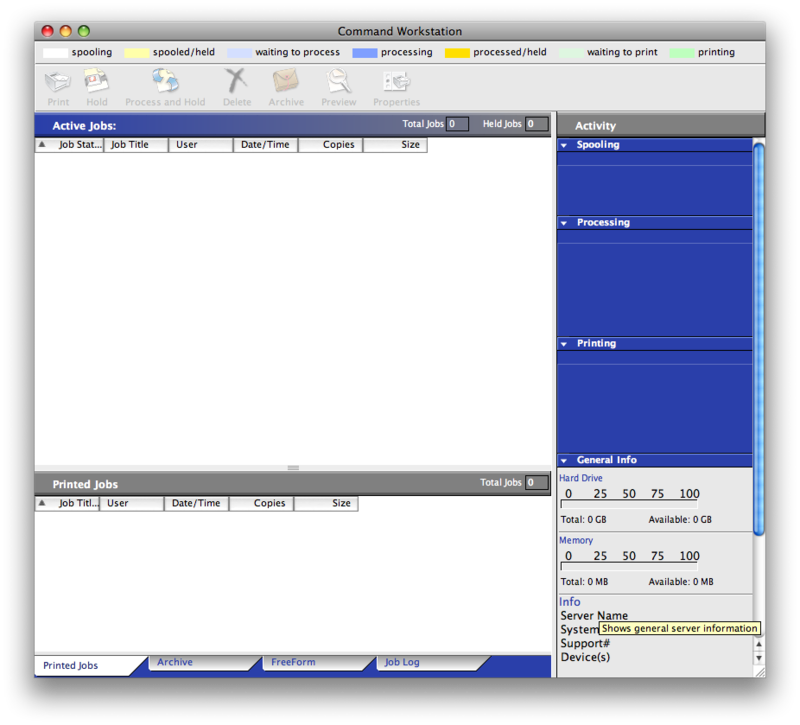 Select Applications (located under Places in the left pane of the Finder window). Drag-and-drop the Fiery folder into the Trash. Under Devices in the left pane of the Finder window, select <Macintosh HD>, where <Macintosh HD> is the name of your Mac OSX hard drive. Delete all the harmony files in LibraryFrameworks. These files are starting with the letter h*.framework, for example haddress.framework, or h10.framework. Delete the file i1C.framework or ES1000.framework in LibraryFrameworks (early versions are listed as i1C and newer versions are listed as ES1000). Delete any files starting with string “CWS” in users<username>libraryPreferences, where <username> is the username currently logged in to the Mac OSX machine. Do not delete the folder “CWSPrefs” at this time. NOTE: If you desire to maintain preferences already created so they will be available following installation, then skip step j and proceed to step k. Otherwise if you desire a clean uninstallation, perform the following step. Delete the folders “CWSPrefs“, “CWPT Preferences” and “EFI ImageViewer Preferences” in users<username>libraryPreferences, where <username> is the username currently logged in to the Mac OSX machine. NOTE: “CWPT Preferences” and “EFI ImageViewer Preferences” will be listed only if CWPT and ImageViewer were previously installed with CWS ME. Delete the folder LibraryApplication SupportEFI. After that, install freshly downloaded copy of Command Workstation.